Chicago, IL (May 28, 2015): David Weekley Homes is excited to announce plans to begin developing a total of 91 homes in the Chicago area, including 43 single-family homes in Barrington’s The Reserve at Barrington and 48 homesites in The Enclave at the Grove in Glenview. 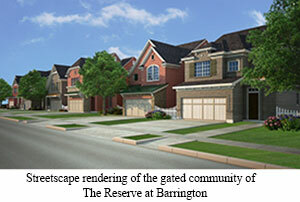 The nation’s largest privately-held home builder recently closed on property in historic Barrington and development is underway for homes in the private, gated community of The Reserve at Barrington. Homes will range in size from 2,400 to 3,200 square feet with homebuyers choosing from five floor plans with owner’s retreat upstairs or downstairs options. Barrington residents enjoy nearby specialty shopping and dining at Village Center, open spaces and wetlands, proximity to parks and Metra Station, with access to Chicago. Students attend Barrington District 220 schools. Weekley Homes has also begun work in The Enclave at the Grove in Glenview. Sales are anticipated to begin in October in this gated community that will include five floor plans with approximately 2,400 to 3,200 square feet of living space. This community, located 20 miles from downtown Chicago, features walking and jogging trails, and nearby ponds and greenbelts. Students attend Glen Grove School, Springman Middle School and Glenbrook South High School. The award-winning home builder is also constructing two-story homes in the Naperville community of Timber Grove. Priced from the $400s, these homes include distinct architectural elements and three to four bedrooms within 2,000 to 2,500 square feet of living space. In addition, 37 custom homes are currently under construction in suburb cities, including Glen Ellyn, Naperville, Wheaton, Downers Grove and Elmhurst. Three homes, priced from the $700s, are approximately 3,200 square feet and ready for immediate move in. For information on floor plans and opportunities in Chicago, contact 312-361-3480.